Reputation management. You might be imagining a celebrity who needs to do damage control after sharing something inappropriate during an interview with TMZ. In reality, reputation management is crucial for any business, big or small. Even a company who doesn’t have a dedicated Reputation Manager is -- or should be -- engaging in reputation maintenance and amelioration on a daily basis. So, what does reputation management for companies look like? In a nutshell, it means influencing and controlling a company’s reputation (shocker, right?). However, with the growth of the internet and social media, the notion of reputation management has transformed into online reputation management. The latter makes search results a core part of a company’s reputation, meaning you control what shows up when someone looks you up online. An important piece of the online reputation management puzzle is online reviews. Online reviews are crucial to any business that wants to keep control of their online reputation. According to The Online Department, “Online reviews have created a new form of marketing and communication that bridges the gap between simple word-of-mouth and a viral form of feedback that can move virtual mountains for a business.” The importance of online reviews for businesses is truly mind boggling. Why are reviews so important? Eighty percent of consumers trust online reviews as much as a personal recommendation. Seventy-two percent say that positive reviews make them trust a local business more. A one-star increase on Yelp leads to a 5 to 9 percent increase in a business’s revenue. Ninety-two percent of consumers say that they will use a local business if it has at least a 4-star rating. Before we get into the importance of positive reviews, we should discuss why it is at all important to have reviews. In other words, what are the consequences of having no reviews? You might think that no reviews is better than bad reviews, but this is not always the case. Without reviews, people doing research on your company are lacking the evidence that you are a real brand that they can trust. Without a number of online reviews to your name, you are missing out on new business. Imagine this: You own a restaurant. Someone is visiting the area and looking for a place to eat. They use their smartphone to determine which restaurants are available to them. The search results show yours and one other establishment on the same street. Your restaurant does not have a single review on Yelp, Google, Facebook or any other platform. The other restaurant has several 4 or 5 star reviews. In that moment, it does not matter that your restaurant has tastier food or better service, the customer will pick your competitor. Without reviews, your business lacks credibility and looks questionable. Prospective customers will wonder why there aren’t any reviews, thinking, “Is this business not popular? Does no one know about it? Is it a bad restaurant?” Every time a potential customer comes across your business online -- and 90 percent of consumers read online reviews before visiting a business -- you might be losing them to the competition. This is what it comes down to: online reviews will lead to increased profit. Reviews give customers the information that they need to make the decision to purchase a product or service from a business. Today’s consumer is highly informed, conducting their own in depth research before buying anything. Reviews are an important part of this research and can be the tipping point in decisions where there is little-perceived product differentiation. Again, imagine you are picking between two hair salons. If both salons offer the same services, fall around the same price point, and are in the same area, the reviews will be the tiebreaker. A consumer will almost always pick the establishment with better reviews as this is the differentiating factor between the two. According to Dimensional Research, 90 percent of respondents who read online reviews are influenced by the reviews in their buying decision. Even more noteworthy is that for every $1 of online revenue influenced by reviews, that impact is multiplied offline by 4x or 5x. Reviews go hand-in-hand with loyalty. Customers who take the time to leave a positive review for a business are far more likely to feel a certain loyalty to that business. There is a much higher chance that they will keep coming back. Think about the good reviews you have written on Yelp, as a customer. You probably frequent those places a lot more often than the ones you didn’t review. The act of leaving an online review establishes a relationship with the business, allowing customers to feel like they have a voice. Consumers want to be able to provide feedback in a meaningful way and know that their voices are heard by both the business and their peers. These reviews will then drive new prospects to your business, making it a tool for both customer acquisition and customer retention. Online reviews work towards improving your website’s ranking on search engines like Google, Bing, Yahoo!, Yelp and so on. The more that is written about your business online, the more important a search engine considers you to be. Besides moving up in ranking, you will also be featured in a wider array of keywords. With reviews coming in, your business website will have a steady influx of SEO keywords that help your business strengthen its online presence. These new keywords will help to bring up your website in search results when customers are looking for the type of product or service you sell. According to MOZ’s Local Search Ranking Factors Survey, online reviews are thought to make up 10 percent of how Google and other search engines decide to rank search results. Online reviews are as critical to your local SEO strategy as link building citations and on-site optimization. If you’ve started collecting reviews, you will soon realize that they are worth a great deal in terms of marketing. Reviews can offer your business benefits that a simple marketing campaign just can’t, they keep working long after the review has been posted. It fosters continual brand awareness, with your customers taking the role of brand advocates. And it’s safe to say that if your customers left a positive public review, they might also be recommending your business offline to their network. Treat these customers well and recognize their efforts, as they are your personal brand influencers. 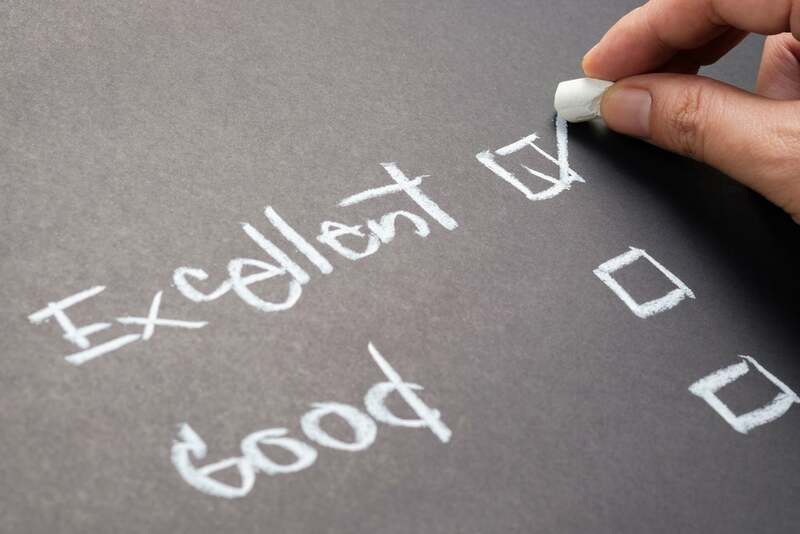 Reviews can tell you where you are excelling and where you might need to improve. By being open to this feedback, your business will be able to better serve customers and adapt accordingly. This will create an even more positive experience, giving customers a sense that their voice is heard and taken seriously. In fact, 78 percent of consumerssay that seeing management respond to online reviews makes them believe that the business cares more about them. It’s important to take all reviews into account. Some companies make the mistake of glorifying positive reviews while brushing off negative ones. Both, however, hold equal value and should be handled accordingly. More specifically, ReviewTrackers found that 52 percent of customers expect to hear back from brands within seven days of writing an online review, particularly one that’s negative or critical. How can you manage your brand’s reputation through reviews? With Bizness Apps’ newest product release, Cardiff, small businesses are able to harness the power of positive reviews. Your branded mobile app will become even more powerful, being a consistent source of online reviews. So, how exactly does this reputation add-on work? 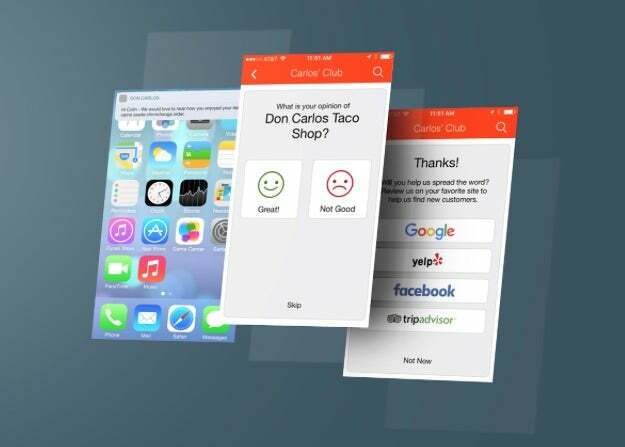 With our mobile reviews campaign, app users will be prompted to review your business on the most popular online review sites, including Google, Yelp, Facebook and TripAdvisor. We ensure only the reviews with positive ratings get published, while you can directly handle the negative feedback as a business owner. The customization component is what really sets our reputation management system apart. You can set up triggers to send review requests when the app users are experiencing a positive interaction with your brand. For instance, users may receive a prompt right after they redeem a reward or after they have enjoyed their meal. Based on a user’s actions within the app, you can determine when they are most likely to leave a positive review about your business. Most companies send out emails asking for reviews days or even weeks after the customer’s purchase. By doing this, they are forcing customers to do the hard work of remembering the details of their last interaction with the brand, long after it has happened. According to Groove HQ, “we already know that customer loyalty is built on making your customers’ lives easier, and that principle extends to asking for reviews, too.” So, the best time to ask for a review is when the value that you’ve delivered to the customer is at the top of their mind. This makes it easy for them to recall what happened and write an honest review. The Reviews Campaign, then, allows you to send out review requests at the right time depending on your business. Once you have set up your campaigns, sit back and watch the results come in. You can track metrics that matter, like total requests sent, total reviews received, and level of satisfaction. And if you have a franchise or multiple locations, you can set up and track performance for each location separately. Each Reviews Campaign will be tailored to reach the right people at the right time. As 72 percent of consumers will take action only after reading a positive review, this reputation management model will directly drive new business. Positive reviews will help you get noticed by prospective customers, get honest feedback from customers, improve your online rankings and turn your customers into marketers. These are all surefire ways to increase your profit as a small business. And if that’s not enough, when you have a collection of online reviews to your name, it encourages others to leave their own feedback too. Reviews breed more reviews, which will only amplify their positive impact on your business. Now it’s time to ask your customers for that word-of-mouth endorsement.